Body Transformation: Bill Has The Brains And Brawn! For a majority of my lifting career, I had been an avid powerlifter. I loved lifting heavy and eating heartily. As a full-time pre-med college student at Baylor University, fixing my diet extensively was always a constant struggle. After dislocating my shoulder a second time, I was told by my doctor that I would have to pare down on overhead lifts, and that I should consider surgery as well. After struggling with the issue, I decided to have my surgery last December. After that I was in a sling for 3-4 weeks and did shoulder rehab for another 4-5 weeks. In that time I fell into a deep mode of self-loathing. I hated what my body was and had become. I felt like a huge slob. Sure, I was strong, but I yearned for something different. In that last 8 weeks, I had accomplished little to no physical activity, with a significant decrease in muscle mass and increase in body fat to show for it. It was at this time time that I had my "aha!" moment. I felt as if I had been given a second chance to reinvent my body and do something "new" with it. I immediately seized the chance and set a new goal. I had always put so much emphasis on powerlifting but did not care about my diet. This time I wanted to dedicate myself to something completely new. I was determined to transform my body into something I always longed to look like, and I was hell-bent at this point on reaching that goal. To be completely honest, I looked to Hugh Jackman's portrayal of Wolverine. He had the type of look I wanted for my body, and I became obsessed with it. I was ripping off pages from TRAIN magazine's issue of "The Wolverine" and posting them to my walls. I even set various pictures as my iPhone background. My mentality echoed Schwarzenegger's words: "Visualize and see exactly what you wish to become." It became my motivation and mission in life, sitting next to my dream of becoming an orthopedic surgeon. While balancing my pre-med health sciences major at Baylor University, my overall fitness and diet became my main focus. I always knew generally what to eat for a proper body, but never followed it. I am a firm believer in the science, so I approached my diet and workout through a scientific lens. I bought a food scale to start weighing all my portions to precise amounts of grams and ounces. I did a plethora of research on scientific studies through Baylor University's research database and Bodybuilding.com's own articles that contained adequate citations for the best approaches to food intake and supplementation, rep ranges, and exercises. My mentality echoed Schwarzenegger's words: "Visualize and see exactly what you wish to become." All of this helped me fix my diet immensely. As I set my eyes on the prize, time went on and I began to see amazing results. I experimented each time I was in the gym until I found the perfect regimen that I believe is a miracle worker. There were many times when my fatigue and exhaustion from the school curriculum made me want to skip workouts, but that picture of "The Wolverine" forced me into the gym 5 days a week for 5 months. In addition, I'm so proud of myself for making the Dean's List and finishing a semester with a perfect 4.0 grade point average. If there is that slight chance that Hugh Jackman actually somehow reads this article himself, I just want to say "thank you." Because of your personal work ethic in the gym, I was inspired to achieve feats naturally that I never thought I'd be able to achieve with my body. Now I believe that 75 percent of physique and performance is from diet, but a shredded body doesn't come from starvation! I found myself eating more than ever during my body's amazing transformation. It's really all about what you are putting into your body and how hard you are working out. Now I experimented for several week on what exercises and sets worked best for me. Be sure to experiment! See what exercises stimulate your muscles the best. Not just that, but I kept my workouts changing consistently; each workout is never the exact same, even if exercises are the same I will mix up the order. It is important to never allow your muscles to get too adapted to your workouts. I do about 10-12 sprints on the treadmill with a hefty incline and speed. My advice is to start out slow and work your way up week by week. Warm up for 5-10 minutes and then set your level. Sprint all-out for 30 seconds, rest for 1 minute, and then sprint another 30 seconds. Do this for 10-12 times total. Definitely just keeping up with everything. Any pre-med student will tell you that their life is consumed by their studies. Yes, I had a deep desire to transform my body, but I was not going to risk my future aspirations of success for it. I coined the phrase "BrainsANDGains" on Instagram and PumpedUp, and I highly believe in not just focusing on just one realm of your life but focusing on all. At first, it was so difficult to adjust, but now it is a lifestyle. I live and breathe it. My future plans are to continue pushing my body, perhaps even try a competition if time allows. I currently am working as a certified personal trainer at Baylor's Student Life Center. I teach two aerobics fitness boxing and conditioning classes a week as part of the "Bearobics" program on campus. I just plan to stick out "BrainsANDGains" until one day I am a successful surgeon and (hopefully) have made greater strides with my body. Visualize your goals! Pick a body you want, research, and see what you can do to reach it. You must visualize before you act. BrainsANDGains! Do not get stuck just worrying about your body because life is more than just looking good. Make sure you are trying to do your absolute best in every aspect of your life. Whether that means in the classroom or in the office, be the best Renaissance man and or woman you can be! Consistency is key. Do not expect to reverse years of what you've done to your body in just a couple of weeks. Keep progress pictures. I documented my whole journey over the course of 5 months, taking pictures on a daily basis. This kept me motivated consistently, and when I go back through them I am truly proud of my current build. You can actually see progress posts I've made through the past couple of months on my Instagram @bsiddiq, on which I have a pretty great fitness following as well. Prepare for success! As a full time college student, I found myself unprepared many times when it came to my diet. I started meal prepping on weekends, and this helped me keep my diet on track. 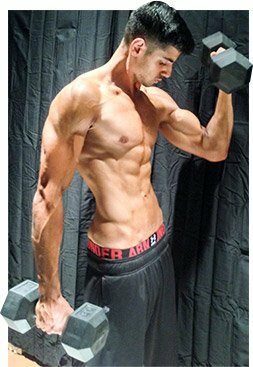 Bodybuilding.com's plethora of articles, supplements, and motivation kept me on track easily. The pieces on Hugh Jackman's workout and frequent scientific articles from writers such as Jim Stoppani always kept me experimenting and intrigued. These things plus unbeatable supplement prices have kept me buying from them for over 5 years now! There is no doubt I would not be who I am today without the love and support of my friends and family. I would specifically like to thank my father and mother: Al and Gazala Siddiq for always loving and supporting me through everything, my brothers Haris, David, and Asim; my encouraging and loving cousins, Saaliha and Usman Khan; my inspirational and strong aunt, Lala Rukh and my supportive uncle, Ed Siddiq. My amazing bosses, managers, and fitness extraordinaire at the Baylor Life Center: Van Davis, Andreas Stamatis, and Clint Patterson. As well, my oldest and closest friend Katherine Howard, and my other good friends Bryan "Brad" Abraham, Soni Naeem, Alex Barbaretta, Spencer Tinkham, Brandon Littles and Victor Norwid (who all played a part in my fitness lifestyle one way or another). I am thankful to all of you, and all my success is in part to all the people I mentioned above.